Europe’s native population is not just aging, it is disappearing. The political and financial establishments rely on false official projections. Despite the UN Population Division prognoses that fertility rates will soon rebound to replacement rates, such a phenomenon is nowhere to be seen. In all European countries native populations have extremely low fertility and they are in full decline, and there are no signs that this will change anytime soon. Whatever official statisticians try to make you believe, an increase in fertility and the growth of populations in countries like France, the UK and Sweden is 100% migration related. These are non-refutable facts: plain mathematics. For now about 50% of the migrants in Western Europe come from Central Europe, however that will not be the case for long. Gefira is one of the few research groups that have the capacity to do our own computer-based projections and our findings are disturbing. Population in Poland has been and certainly will be decreasing because of the low fertility rate (1,36 in 2016) and long-lasting emigration. The Polish state-run Central Statistical Office (GUS) predicted such situation but its forecasts include not only emigration but also immigration mainly from Ukraine and even with people moving to Poland the situation does not look good. The Gefira calculations, excluding migration, forecast 30 million native Poles in 2050 and 13,5 million in 2100. Cerberus 2.0 calculations and those by GUS diverge. We analysed the demographic phenomena on the basis of the fertility rate and life expectancy, and we left migration out of the equation. Our estimates predict a larger number of Poles by 2028 than GUS does because we include Poles living abroad. 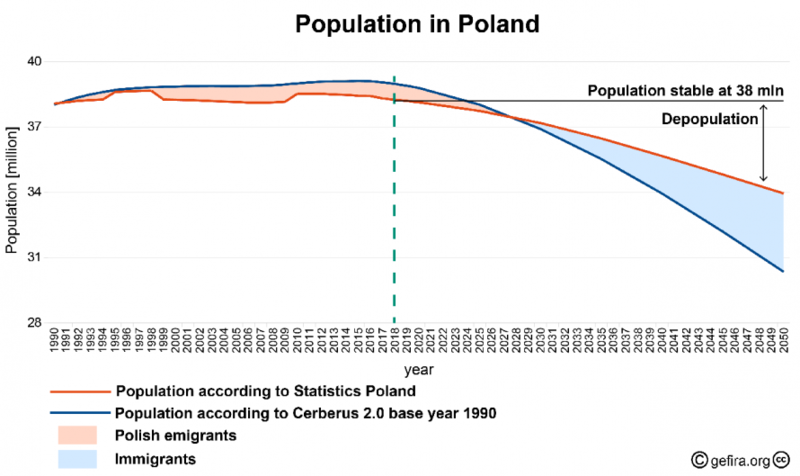 After 2028, according to official forecasts, there will be more residents in Poland than the number of native Poles calculated by Cerberus 2.0. 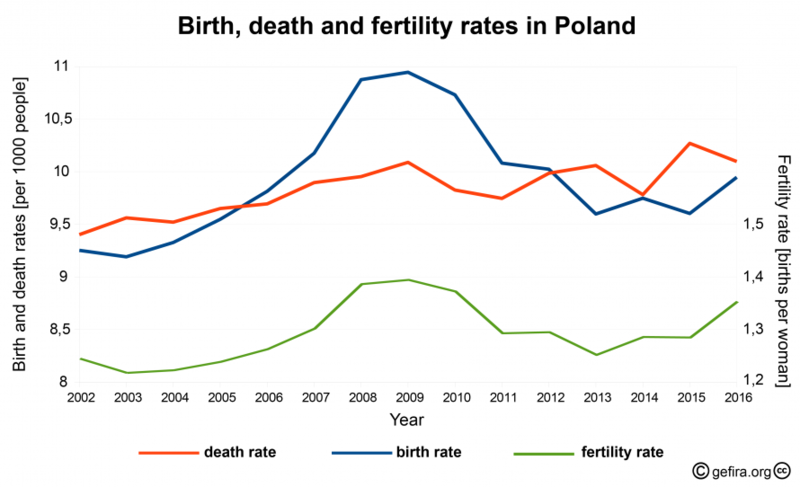 This is only possible if more migrants are moving to Poland or there is steep increase in fertility rate. Cerberus 2.0 indicated the decrease in the native population a few years later than GUS but with a faster pace. The big problem in the whole of Europe is the low fertility rate and Poland had almost the lowest one in 2015. In 2016 there was growth in the number of births but it was too small and the fertility rate did not change significantly. The birth rate has been at a dramatically low level for over 15 years (215th place for 224 countries in the CIA World Factbook). Currently the number of births is almost by half lower than the values recorded during the last demographic boom in the first half of the 1980s. Fertility declined rapidly through the 1960s, rebounded above 2.1 and sunk far below 1.5 and never rebound. Analysts expected a growth in birth from the mid-90s of the last century. It would be a natural consequence of the large number of women born in the 1970s entering the highest fertility age but this did not happen. In the years 2004-2009 the total of births increased a little because the effect of “postponed births”. For 25 years a low number of childbirth was not enough for the generational replacement. According to the GUS the demographic changes are the result of the choice of young people who want to gain education and economic stability first. The age the most women gave birth has risen since the beginning of this century, which in 2016 amounted to 29.9 years as compared to 26.1 years in 2000. During this period, the average age of birth of the first child also increased from 23.7 to 27.8 years. But renowned demographers expect this trend to change miraculously. Since the accession of Poland to the EU, Poles have been leaving the country on a monumental scale. The main reasons of emigration are higher earnings and standard of living abroad and opportunity to travel and explore the world. Poland is exchanging its youth and its future in return for subsidies and empty highways funded by Brussels. Those who emigrate are often professionals. Now there is a shortage in Poland among labourers, office technicians and care assistants, the same jobs Polish emigrants do abroad. According to GUS in 2016 the migration balance was positive for the first time in many years. The National Polish Bank, using its own data, announced that there are about 1 million Ukrainians in Poland and this number is rising. It is also estimated that by the end of 2020 some 200-300 thousand Ukrainians will be coming to Poland every year. Official statistics show that more and more Poles come back to Poland. However, are these data correct? Poland is the country of statistical fiction. There is a freedom of movement and not many people report their departure. The aging society has a negative impact on many important areas from the pension system to health care to the structure of the labour market. And here is the vicious circle: people leave because they are afraid that they will not not be provided for in old age, but leaving they make these problems worse. Small towns suffer most. A smaller population means a smaller workforce and next fewer workers means lower production and negative economic growth. Companies will have to figure out how to use available human resources. The low birth rate in Poland does not only affect Poland. Many young Poles have emigrated and become a part of the workforce of another country like Great Britain or Germany. now that this inflow is smaller, someone will have to take the place of Polish workers in the countries with. In Western countries, companies are already complaining about a lack of Central European workers. At the same time, unemployment among the young migrants from Syria and Eritrea is about 80 to 90%. Poland is in a difficult demographic situation. Possible solutions are of course more children and immigrants. As for the first, the government is trying to boost the birth rate with paying 500 zł for every second and consecutive child until they reach 18 years of age. In 2016 maternity leave of 20 and parental leave of 32 weeks were enacted. As for the second solution, immigrants, only those from Europe are welcome. The government do not want to accept people from Africa and Central Asia. A part of the society does not accept immigration from people who have their roots outside Europe. To keep Poland at a stable population of 38 million inhabitants with migrants, the Polish government realize it has to implement an outright repopulation policy that turns Poland into another country. Because the Polish population is in full decline migration means replacement with settlers from Afghanistan, Turkey, Morocco, Nigeria or other countries. About European settlers Noam Chomsky said: “The settler-colonial societies are a striking illustration of, first of all, the massive destructive power”. European settlers occupied foremost nearly empty land and still liberal intellectuals considered that a horrendous crime. How much more destructive must colonization be when it concerns populated areas as is happening now in Western Europe? Poland is not popular with Africans or Asians. Social security in Western Europe is three times as high as the minimum wage in Poland. Due to high unemployment among migrants, social security schemes are an important part of the re-population policies in countries like the Netherlands, Germany, France and Sweden. Poland is simultaneously in the demographic phases typical for developing (such as surplus labour) and developed countries (such as large economic immigration and ageing society). The state does not copy the policies of western countries and does not base the future of Poland on immigrants from Africa. Thanks to its rigid migration policy the country will be more united. Poland will preserve its culture and traditions. Even in the case of a black scenario where the population will shrink below the 10 million, it will still be able to rebound and start growing, while at that time countries like France and the UK will have populations that do not consider themselves French or English.